Gold Road Resources has formed a 50/50 joint venture with a wholly owned Australian subsidiary of Gold Fields Ltd. for the development and operation of the Gruyere gold project approximately 200 kilometers (km) east of Laverton, Western Australia. Gold Fields is purchasing a 50% interest in the project for aggregate consideration of A$350 million in cash and an uncapped 1.5% net smelter return royalty on Gold Fields’ share of production from joint-venture tenements once total gold production exceeds 2 million oz. The cash consideration includes A$250 million paid on completion of the transaction in mid-December and A$100 million that will be contributed by Gold Fields to fund Gold Road’s initial cash calls during the construction phase. Located on the South Dorothy Hills Trend, Gruyere is one of the largest undeveloped gold deposits in Australia. Gold Road completed a feasibility study of the Gruyere project in mid-October. The study considers development of an open-pit mine producing an average of 270,000 ounces per year (oz/y) of gold over a 13-year mine life. Capital cost to develop the project is estimated at A$507 million, with an additional A$77 million in sustaining capital required over the life of the mine. All-in life-of-mine sustaining costs of production are estimated at A$945/oz. Proven and probable reserves at the Gruyere project total 91.6 million metric tons (mt) at a grade of 1.2 g/mt of gold, containing 3.52 million oz of gold. 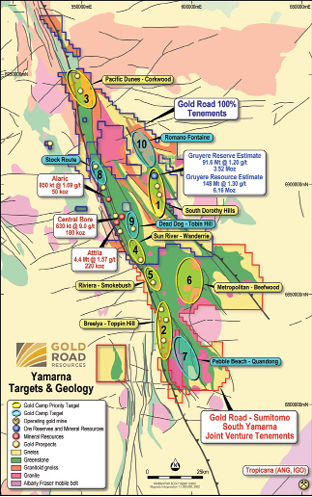 ject under the management of Gold Fields. Gold Road will continue to manage the project during a transition period of up to six months following completion of the transaction, after which Gold Fields will become the manager. Alcoa Corp., the world’s largest bauxite miner, announced on December 19 that Alcoa World Alumina and Chemicals (AWAC) has secured its first major third-party contract to supply approximately 400,000 bone dry metric tons (bdmt) of bauxite from its Huntly mine in Western Australia, furthering Alcoa’s strategy to grow its third-party bauxite business. “This Western Australian contract comes just months after our first trial bauxite shipment from Western Australia to China in mid-2016, which successfully introduced our Western Australia product to the global market,” said Garret Dixon, president of Alcoa Bauxite, who is based in Perth. The government has also granted approval for Alcoa to export up to 2.5 million mt per year (mt/y) of bauxite for five years to third-party customers. “Bauxite exports have the potential to generate greater value from our Western Australia mineral lease, creating additional revenue streams for Alcoa and the state of Western Australia, while maintaining supply to our three Western Australia refineries,” Dixon said. 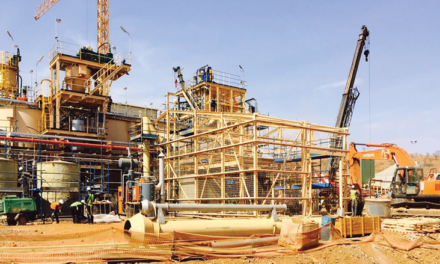 This contract is one of three bauxite agreements recently signed worth a total of 126 million to deliver approximately 2.2 million bdmt of bauxite to customers in China in 2017. In addition to this contract, Alcoa will supply bauxite from its two mines in Brazil—Juruti and Mineração Rio do Norte, where Alcoa and AWAC hold an 18.2% equity investment. The two supply agreements for Brazil bauxite replace 2016 contract volume. The contracts increase the total value of Alcoa’s 2016 and 2017 third-party bauxite supply agreements to nearly 600 million. Alcoa had 45.3 million bdmt of production in 2015. On November 1, Alcoa Corp. announced it had completed the separation from its parent company Alcoa Inc. (now named Arconic Inc.) and began operating as an independent, publicly traded company.